Mother nature is painting spectacular colors across the landscape of coastal Maine right now! This week colors are nearing their peak and only in Camden Maine can you have the unique chance to see the colors and the ocean while you ride the chairlift to the top of Ragged Mountain. Each fall the Camden Snow Bowl, just 3 miles from town, opens for just two Sundays giving visitors and residents a real birds eye view of the blaze of glorious colors that wind their way to the coast of Penobscot Bay. 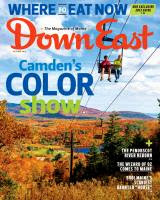 The colorful show is so spectaculat that Downeast Magazine features the chairlift ride on the cover of their October, 2013 issue this year! Take a look! Here in this small coastal town is a wonderful site to see folks heading for the chairlift, anxious to look out from the 1,300 ft summit over the blueberry barrens, the rolling hills to the shore and nature's colorful blast. Better yet, come to Camden and take the chairlift! Bring your camera... and perhaps even a picnic lunch! You can ride to the top, picnic and then ride back down. A great way to spend a fall afternoon.